Everything about this album screams Bon Scott era AC/DC right down to the cover artwork featuring guitarist L.G. Valeta in an Angus Young pose. That’s quite something for a band that hails from Barcelona! 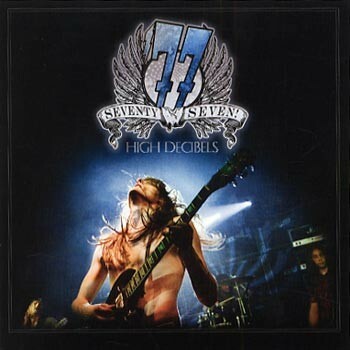 For 77’s second album, what you get is eleven songs of AC/DC style rock’n’roll boogie with vocalist Armand Valeta imitating Bon Scott, but also with a ‘Dizzy’ Dean Davidson (Britny Fox) flavour about him too. L.G. Valeta has Angus’ chops down to a ‘T’ but occasionally he lets rip on the solos, such as getting carried away on the end solo of ‘(Gotta Go) Gotta Hit The Road’, which is a real driving rock’n’roll anthem or indulging in a wild solo on the mid-tempo rocker ‘Since You’ve Been Gone’ (absolutely no relation to the Rainbow song). ‘Gimme A Dollar’ is also one of L.G.’s guilty pleasures as another wild solo is stamped all over it like an excitable dog who won't let go of its rag doll whilst he improvises on the opening solo before engaging in a chugging riff that drives the song along on a continual refrain with more than a musical resemblance to the Rolling Stones’ ‘Not Fade Away’ from as far back as 1964 no less! Drummer Johnnie ‘Dolphin’ Riot and Mr. Raw (yes, really!) on bass are as competent as any pro musician on the scene without setting the world on fire but with former AC/DC drummer Simon Wright, for example, acknowledged as one of the best in the business and Cliff Williams, bassist since 1977, on some of the rock world’s most revered albums, it’s not exactly the worst thing in the world to copy them. Personally, best song honours have to go to the good sleazy rock’n’roller ‘Backdoor Man’ and the mid-paced rhythmic ‘Meltin’ In A Spoon’ with some interesting lyrical assonance. The writing style is pure 70’s and it’s probably no coincidence that AC/DC’s ‘Let There Be Rock’ album surfaced in ’77. The title track probably defines this young Spanish band as it’s descriptive of their ideals in being autonomous. Their eight minute plus epic ‘Promised Land’ is also synonymous with their early days struggling to survive in London and it’s worth noting that this song features Sweden’s Backyard Babies’ Nicke Borg and Dregen as guest vocalists. 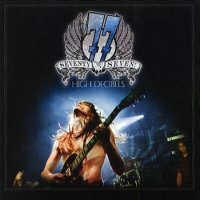 Production by the former Hellacopters (now Imperial State Electric’s) Nicke Andersson is crisp and raw capturing them live in the studio and the whole authentic and organic feel of the album leaves a definite smile on my face. So, if you’re ever short of a present to take to a party, then you can’t go far wrong bringing this little nugget with you.